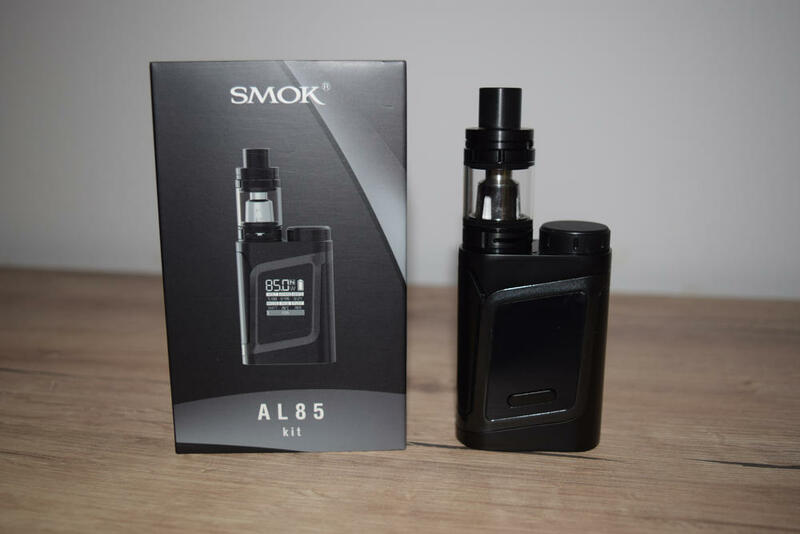 If you thought SMOK couldn’t go any smaller than the AL85 and still be able to incorporate that gorgeous 0.96 inch display, you were wrong. 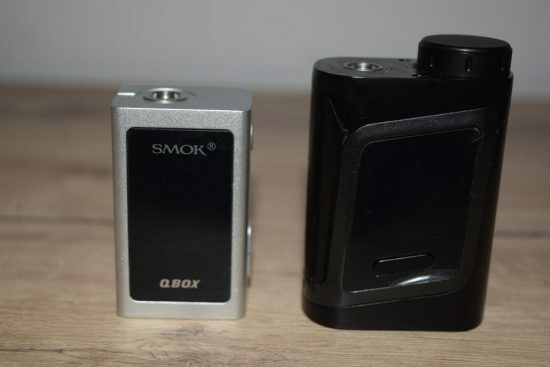 The new SMOK QBOX is not only a lot smaller than anything the Chinese company has ever put out, but also than pretty much any other advanced mod I’ve ever used. This thing is so tiny and light that you can easily slide it into your small jeans pocket and forget all about it. But what really surprised me was that despite its limited size, the QBOX has all the features of its older brothers, the SMOK Alien 220W and the AL85. 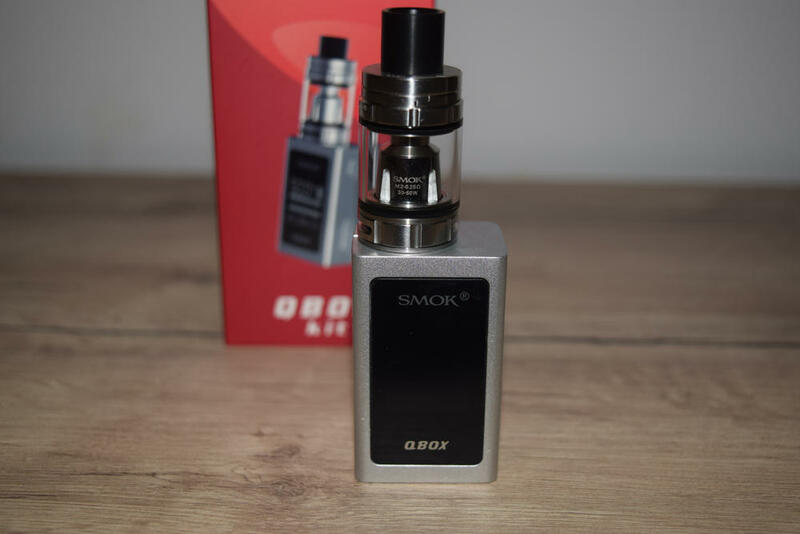 The SMOK QBOX comes in the usual SMOK packaging, a large rectangular cardboard box with an image of the mod on the front of the package, and a list of contents, a short description and company information, on the back. Inside the box, we have the tiny QBOX placed in a styrofoam holder, and under it, we have the SMOK Baby Beast tank, which comes with a couple of new generation M2 coils, a USB charging kit, a bag of spare o-rings for the tank, two vape bands, and a user manual that looks more like a leaflet. 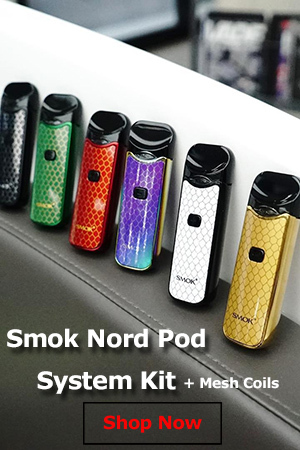 All in all, this is the same kind of all-in-one kit that SMOK has been offering for a while. It even comes with the usual tank they like to pair all their mods with. 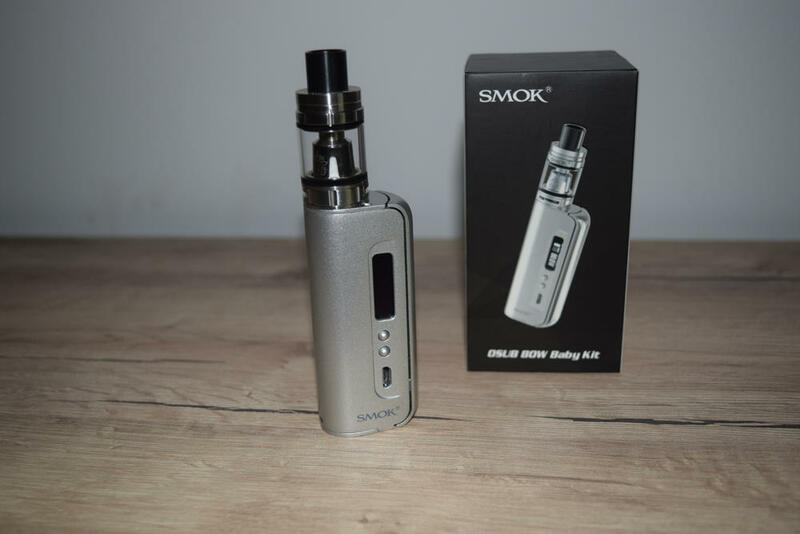 That might not mean a whole lot if this is your first SMOK kit, but after having tested about half a dozen, all of which came with the exact same tank, it’s starting to get a little old. The main thing that the SMOK QBOX has going for it is its reduced size. If you’re looking for something absolutely tiny, something that you can carry in virtually any size pocket or purse, you’re going to have a tough time finding anything smaller than this. 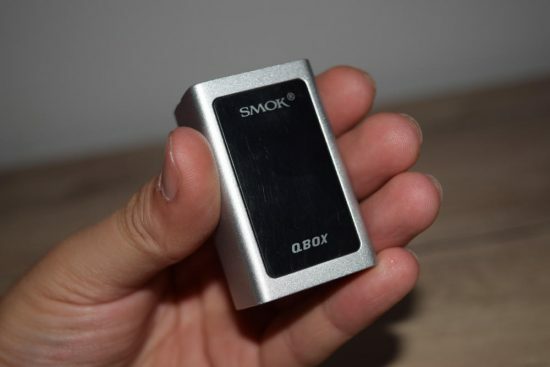 At just 54.8 x 33.6 x 25, the QBOX is smaller than a Zippo lighter and only slightly bulkier. It’s basically a small metal cube that you can literally fidget with like you would a small toy. It’s really, really tiny, even for a guy with small hands, like me. Design-wise, the QBOX has a square shape, with a 510 connection placed on top, a generous 0.85 OLED display on one side, and three plastic button (one fire button and two “up” and “down” buttons) on another. One the bottom of the device, we have a few venting holes for the built-in battery and a USB charging port. That’s about all there is to mention, and while it may not seem like a lot, when you take into consideration the size of the mod, it’s more than enough. I liked the fact that the 510 connection isn’t too close to the edge of the mod, allowing you to use atomizers with a diameter of up to 23 mm with no overhang, and even 24 mm, with minimal overhang. Most people are probably going to use the QBOX with smaller 22 mm tanks, but it’s nice to know you can go bigger without ruining the look of the setup. 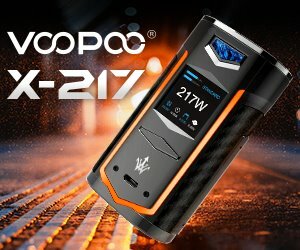 The display is the same one we’ve seen on a series of SMOK mods, from the Alien 2201, and the AL 85, to the new modular SMOK GX2/4. It’s actually the same size display, despite the QBOX being considerably smaller than all those devices that I just mentioned. That means you can see all the different settings and options displayed on screen without straining your eyes. The buttons may be plastic, but they’re actually really well made. They are nice and clicky and don’t rattle one bit. 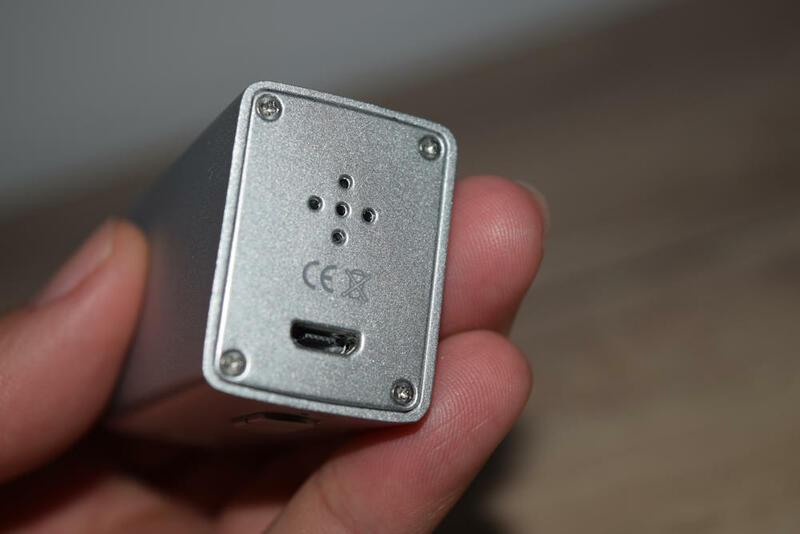 There are a couple of things I didn’t particularly like about the design of the QBOX – one was the location of the charging port, on the bottom of the device. You can easily set it on one of the sides, even with the Baby Beast tank attached, and it won’t leak, but if you have a dripper on, it becomes an issue. I don’t know why they decided to put it on the bottom, and not on one of the sides, maybe because the screen was taking too much space, but it’s still a con. The other thing I didn’t like was the slightly bulging bottom of the QBOX. There is a lot going on in this tiny little cube, and if you turn the device upside down, you can see that the bottom panel is a bit curved due to the pressure inside. If you spin the QBOX in place, it’s like a small high-tech spinner due to this curved bottom, and even though it doesn’t really affect the performance of the mod in any way, I think they could maybe have made a few millimeters bigger so that all the components fit comfortably. All in all it’s cute little mod, so if you like tiny things, you’ll probably love it. 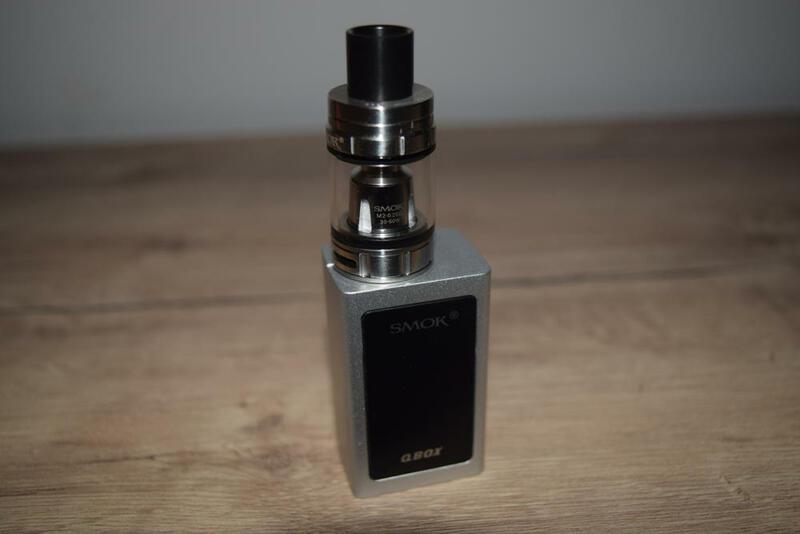 Having just wrapped up my review of the new SMOK GX2/4, which has the same identical display, menu system and navigation, I don’t think going into great detail about them here makes much sense. 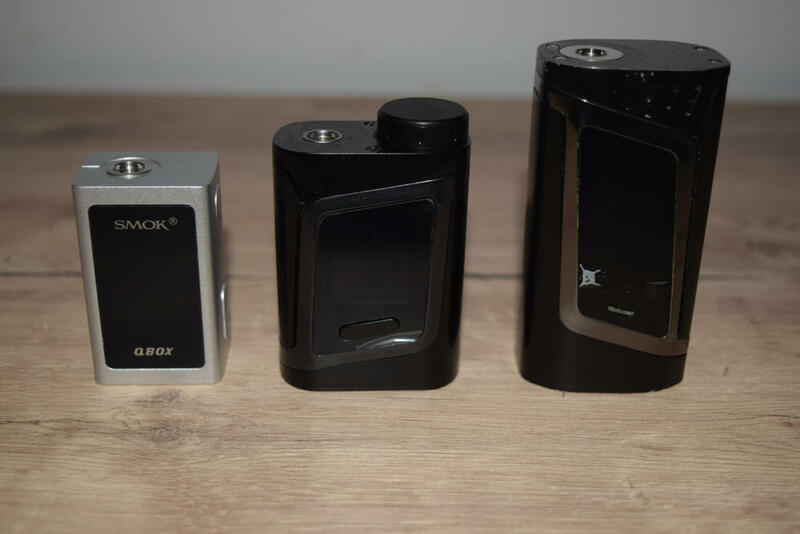 You can check out that review for more information, or my reviews of the SMOK Alien 220W and AL85, for that matter, because they all share the same chip. While we’re on the subject, I think it’s time SMOK moved on to a newer chip. The success of the Alien shaped the Chinese company into the vaping industry colossus it is today, but all great things must come to an end, and I think we might be there already. The Alien only came out last year, I know, but things move incredibly fast in this industry, and you have to constantly come up with new and innovative things to stay ahead. I for one have had enough of this chip already. If you’re not going to improve it considerably, at least stop putting out “new devices” that are essentially using the same technology. 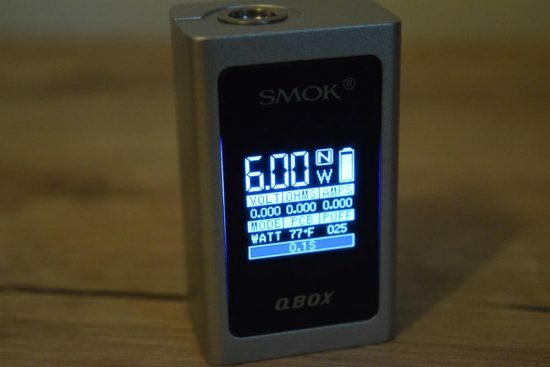 Battery life is undoubtedly the Achilles’s heel of the SMOK QBOX. Any way you look at it 1,600 mAh battery capacity is not very much, and there’s nothing you can do to increase it, since the battery is built-in. 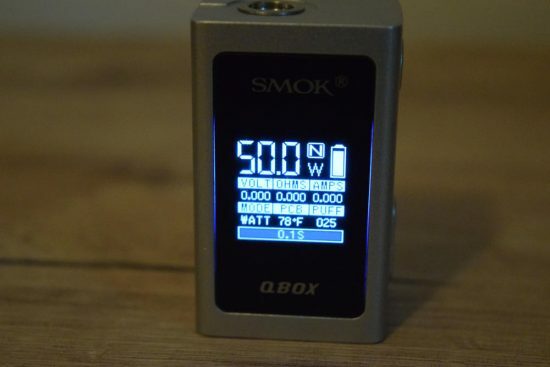 Now, this device has a maximum output of 50W, and if you were to use it maxed-maxed out all the time, it will probably last you about 3, maybe 4 hours, depending on how often you use it. I’ve actually been vaping at around 35 watts with one of the included M2 coils, and I’ve gotten just under 5 hours of use out of it, which is not too bad. Still, if you’re looking for something that has a decent battery life, this isn’t it. 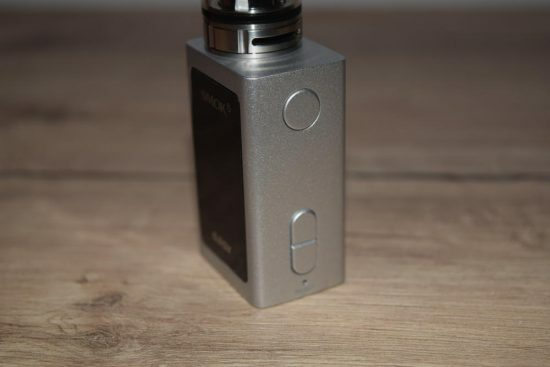 Looking at the size of the QBOX, battery life was always going to be a problem, so I kind of which that SMOK had went the rout Wismec chose with its RX Mini kit, which was making the device a bit bulkier, but upping the battery capacity to over 2,000 mAh. This way, the QBOX is good for a short outing, but anything longer than 4 hours is going to leave you with a dead fidget cube. Performance is actually pretty surprising for such a small device. Granted, the 50W max power output isn’t particularly surprising when comparing it to a dual-18650 battery mod, like the Alien 220W, but you always have to keep the size in mind. 50W is pretty decent, although the 80W of the Wismec RX Mini is considerably better. Still, the QBOX pairs great with the Baby Beast and its new M2 coils, creating impressive clouds of warm vapor at just 30-something watts. I’ve only been using the QBOX in wattage mode, mainly because I’m not a big fan of temperature control, but that feature is available in case you’re interested. It supports Ni200, titanium and stainless steel, and also has a preheat function, allowing you to set the wattage all the way to 50W. Temp. control is nice, if you’re into it, although I would suggest a more powerful device for a better vaping experience. 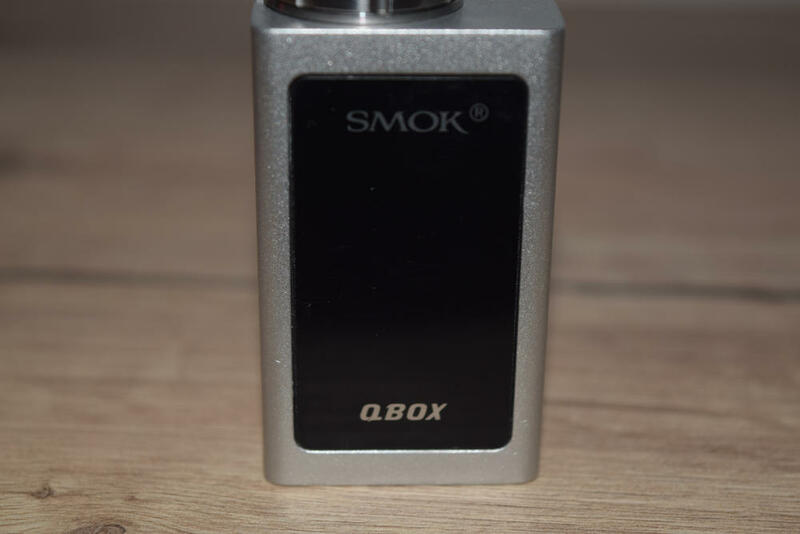 I’ve had no technical problems with QBOX in a whole week of vaping, nor did I expect any. 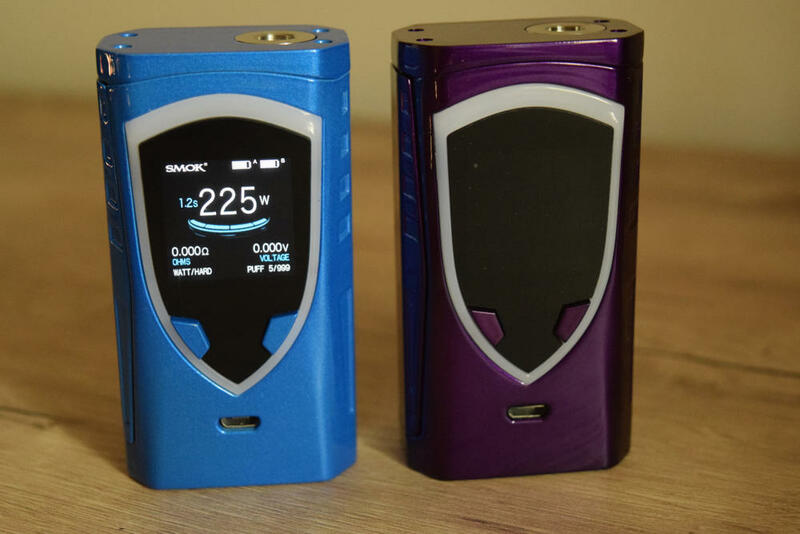 As I mentioned above, this is basically the same chip that SMOK has been using since the Alien came out last year, only limited at 50W output. It’s a solid chip that comes with the newest firmware, so you shouldn’t run into any difficulties. Still, if that were to happen, you do have a small reset button on the mod, which returns the device to factory settings. I I had a dollar for every time SMOK paired the Baby Beast tank with one of its many mods, I’d probably be $20 richer. This is the most popular SMOK tank ever released, and for good reason. At 22 mm in diameter and with a juice capacity of 3 ml, it is one of the most versatile tanks money can buy. It has a wide range of coil-heads available, from extreme sub-ohm coils to mouth-to-lung coils and everywhere in between. It’s a really solid tank and a worthy member of the TFV8 family of tanks, and if you’ve ever used one, you know what I’m talking about. I’m currently using four Baby Beast tanks to test a line of e-liquids faster, and they are all working great. I’ve never had a leaking issue with them, juice consumption is decent even with the lower resistance builds, and they are super easy to refill, thanks to the proprietary SMOK swivel top cap. It’s a really nice tank, so if you don’t own one yet, this is a good time to get it. But, as with the Alien chip, we’ve already covered the Baby Beast tank numerous tanks, so there’s no point in just regurgitating the same things over and over every time SMOK decides to pair it with a new device. It’s good, versatile tank, that pretty much sums it up. In case you haven’t figured it out after reading this review, the SMOK QBOX is a tiny pocket mod. That has its advantages, like easy portability and stealthiness, but also comes with a significant drawback – a limited battery life of just 1,600 mAh. That’s just not enough for a whole day of vaping, no matter how low you set the wattage, so unless you plan on buying it as a backup for your main vaping setup, I just can’t recommend it. Having to always worry about battery level is no fun, so I really suggest you only consider getting this as a secondary device or as showpiece. Otherwise, it’s very interesting to see virtually all the features of a large dual-battery mod on this little cube. Bought one for over 50$ and the screen blanked out … they RMA’ed me a used different colored one . It worked about a month and it blanked out ..last thing it said was fully charged nice and clear.I loved the thing if it lasted but can buy almost 4 rock vapes that laxt longer then that ! I have had three vapes from smoke and only one is so far ok is the v8 … the other 2 are the qbox’s ..thats all.